Evacuating people with reduced mobility (PRM) from multi-storey buildings can be a difficult task. A number of commercially available devices can be used to assist in moving the PRM to the ground however, there is little consistent data quantifying the relative performance of these devices. 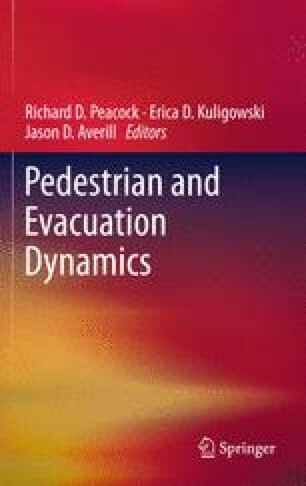 In this paper four commonly used assist devices, the Evac+Chair, Carry-Chair, Stretcher and Drag Mattress are used in a series of 32 evacuation trials designed to assess their performance. The trials involve moving a PRM from a wheelchair to the device, moving the PRM along a long corridor to a stair and then down 11 floors to the ground. The performance of the devices is then assessed in terms of travel speed on the flat and stairs, number of handlers required to operate and ease of overtaking by other stair users. The authors are indebted to a number of people who enabled this project to happen and who assisted in carrying out the work, in particular, Prof N Fraeyman of UZ who permitted the work to be undertaken at UZ, utilising both UZ buildings and staff, Mr Filip Buckens the coordinator of the UZ Manutentie Team and his 18 staff who donated their time to the project and did all the heavy lifting (and sitting), the 24 UZ student volunteers who ran up and down the stairs, the team of UZ administrative staff who contributed to the logistics of the operation, the 11 friends of Mr Adams who volunteered to assist with the stopwatch observations, the video camera team and finally, Ms Aoife Hunt, a PhD student from FSEG who assisted with the trials and who is currently undertaking a detailed analysis of the video footage as part of her PhD studies.